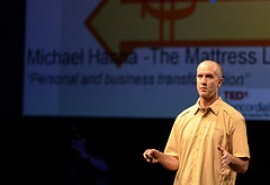 Small-business owner Michael Hanna describes his personal and business transformation from out-of-work corporate executive to mattress delivery guy. Hanna lost his job at the height of the recession in 2009. A few months later Michael and his wife Mary Ruth took a gamble on a truckload of mattresses and an old u-haul truck. Two years later the Hannas run Mattress Lot, a community-based small business which challenges traditional big-box retail business models.